Have you ever tweaked a recipe over and over again until it becomes yours? About 20 years ago I had begun to do this with a chocolate chip cookie recipe. After about 6 or so times of making it, I got it just the way that I like it and might I say that many of my friends do too. So blogging is all about sharing, and I thought I would share the recipe with all my blogging friends. Here they are getting ready to go into the oven. Tip: I use an ice cream scoop to shape and scoop them onto the baking tray. They are all relatively uniform at that point. Cooling after being in the oven. Yum! Just how I like them, chunky, chewy, and gooey! Here is the recipe, now you need to try them and let me know what you think. Place sugar, brown sugar, butter, eggs, and vanilla in bowl. Use electric mixer. If you have a Kitchen Aid turn to Speed 2 and mix for 30 seconds. Stop and scrape bowl. Turn to Speed 4 and beat for 30 seconds. Place flour, salt, and baking soda in the mixture, gradually on Stir speed for about 2 minutes. Increase to Speed 2 and beat for 30 seconds. Add chocolate chips on stir speed and mix until blended. 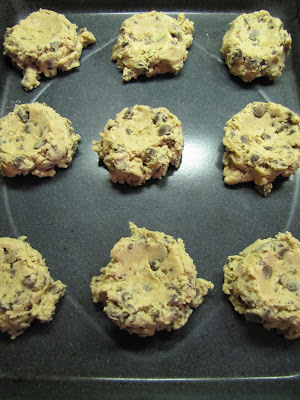 Drop by scoopfuls on baking sheet. Bake at 350˚ for 10 to 12 minutes. I like to do 10 minutes first. Then check and bake until just slightly brown or slightly undercooked. Remove from oven and cool on baking sheet for 2 minutes before removing to a cookie rack to cool. I almost forgot. Would you like to win these? I am giving these beautiful Kona Cotton Solids away. There 6 half yard cuts!!! But you will need to visit my friend Rita, today. The giveaway is on her blog and it ends on Saturday, May 7... Australian Time. Just click here to enter the drawing!